How do you call on students in your classroom? I think our natural default as teachers is to call on the student with his/her hand up. It's quick, easy, and keeps the lesson going. What it eliminates, though, are the students who may need the lesson the most. Among others, they could be the students who are still working through their understanding, the ones who may be checking out since they know others will handle the answers, and those who may need a bit more wait time before they are able to answer. When we limit the responses to just the same few voices, it also brings down the energy and engagement in the room. When students know they will be randomly called on, they will need to be ready to answer at any time. As a teacher, this increases my own energy, too. Hearing from new voices with different views cultivates some amazing classroom discussions we would have otherwise missed out on! I am compiling my top five resources for randomly calling on students. 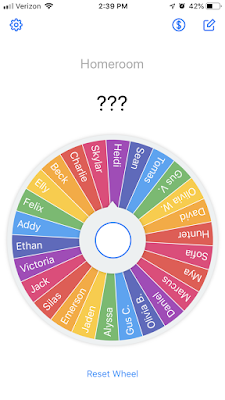 If you have a favorite I missed, please leave it in the comments! 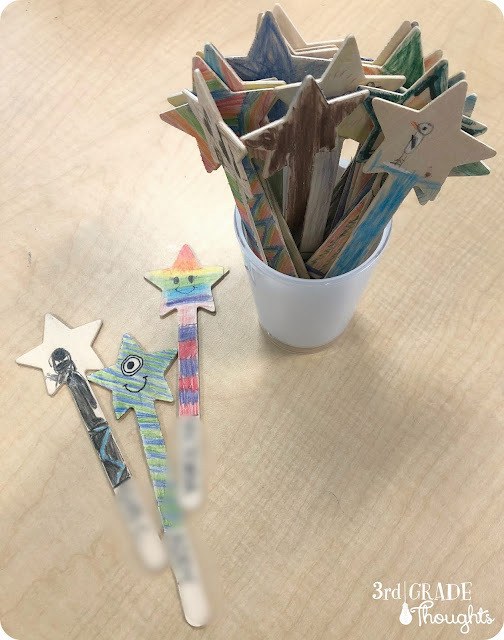 These Star Sticks are the most popular in our classroom. At the beginning of the year, I pass out one star stick to each student with their name on the stick. They decorate their star with colored pencil any way they would like and we add it to our class jar. I use colored pencils because marker can sometimes smear or come off on hands. I also prefer the stars to the boy/girl cutouts since it makes it more uniform across the class. If I want to ensure I don't call on that student again, I will either put the stick aside, or put it back into the jar upside-down. That way I can make sure I get through the whole class before the rotation begins again. Pick up a set of 25 of these Star Sticks on Amazon HERE. I love using student numbers in the classroom. Read more about this system HERE. The nice part about using student numbers in any of your classroom decor and routines is that you can reuse those materials year after year. 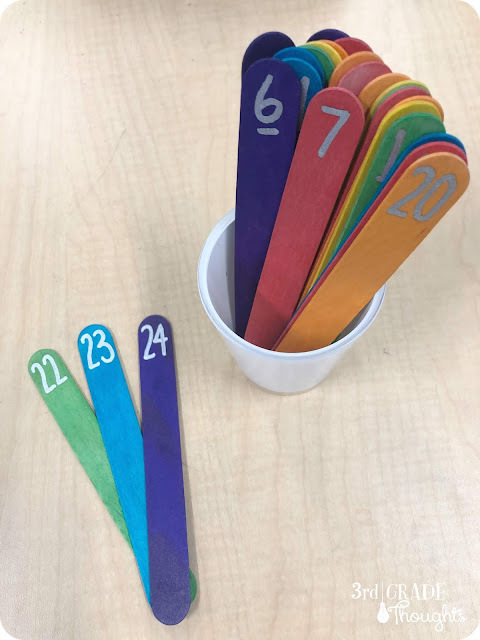 I love these multicolored jumbo popsicle sticks and using metallic Sharpie paint pen to number them. After I call on a student, I can put their stick back in number-side down so I won't call on them again. I can also use these for all sorts of additional classroom organization needs, like calling up students one at a time for conferring. If they need a conference, they can place their numbered stick on my table and I can see who is ready and in what order. The Tiny Decisions app is a great tool that is on my phone and preloaded with all of my students' names. 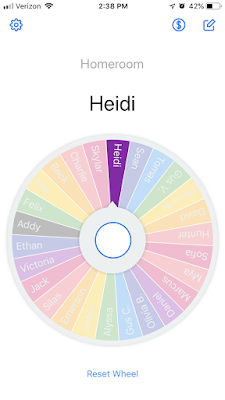 I can hit the middle button and the wheel spins and lands on a random student's name. 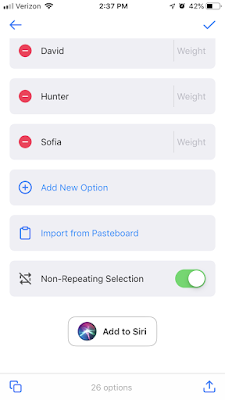 You can load several lists for different groups of students and there is an option to allow for repeats or not. The interface is so clear and colorful, you could display this on a projector if you'd like. There are so many different apps like this, some for free and some paid. I like this since it is free, although that does mean ads. 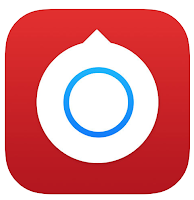 I have an iPhone, so I am not sure if this exact app is available for Android, but it should be easy finding something comparable. 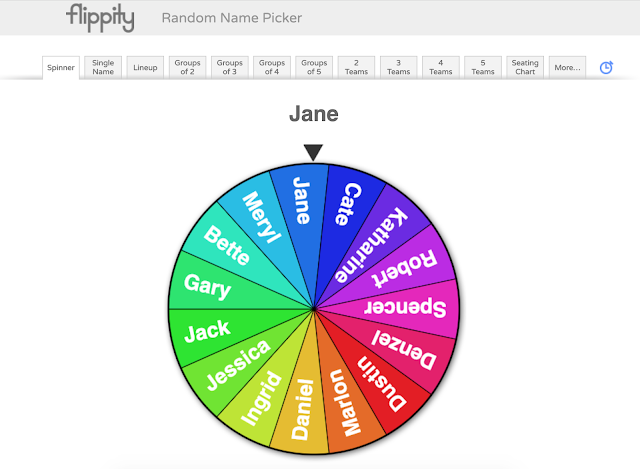 Flippity is a web-based program that will turn your Google Sheets into anything you can imagine! Their Random Name Generator is fantastic. Not only can you randomly choose one student, you can make random groups of 2, 3, 4, or 5. You can also make teams, a seating chart, or a lineup! Their template comes with very specific instructions, so you will want to follow them to the letter and also bookmark the site for quick access. While you're there, take a peek at some of their other features. It's a very fun site to explore! We all have decks of playing cards that are missing some, so this is a great way to find a new use for that stack! 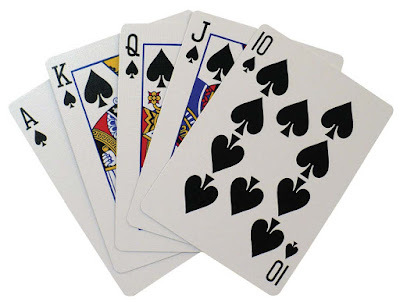 Write a student's name on each card, then shuffle the deck and draw. You can also include the Jokers for "bonus points" to the next person drawn, or another fun incentive like that. This is a great system since a deck of cards is so easy to transport around the classroom or school. An important thing to remember about randomly calling on your students is that it all comes down to the community you have established and knowing the individuals in your class. If students know they will be supported, if they have been exposed to the Growth Mindset, and if you have worked to create an encouraging classroom environment, randomly calling on any of them during a lesson will increase engagement and promote classwide discussions and inquiry. You can easily combine the ideas above to mix it up and keep it fresh. Having at least one that is easy to use and accessible will help substitutes or any guest teachers that want to use the system. You can work together to create a strategy that works best. Ensuring that these more reluctant students have buy-in to this process will help your whole class enjoy this time so much more. 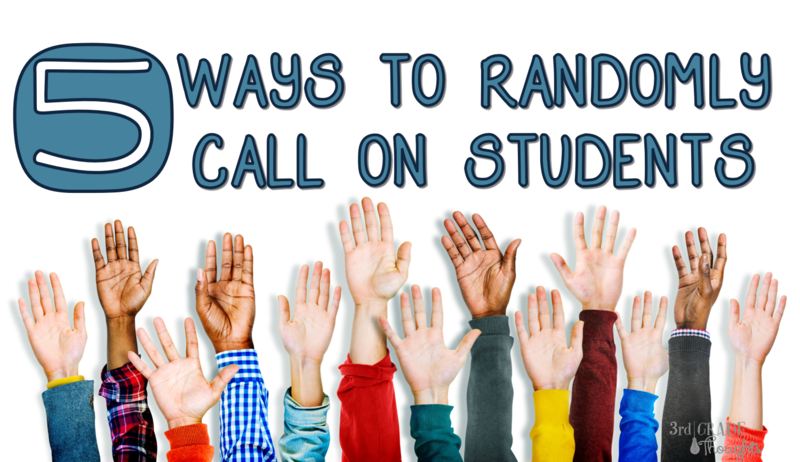 Do you have any additional suggestions for randomly calling on students in your classroom? Thank you! I love the app suggestions and the star sticks are so much cuter than the popsicle sticks I use now. When I do pick from the popsicle sticks, the kids love it. I say, “Drumroll please” and they use their desks or thighs to do a drumroll. They even do if I forget to ask for it. And these are fifth graders! Also, after I announce the name, students yell, “You can do it!” and that boosts the confidence of the chosen student. Of course, making an inclusive atmosphere took some work, but it’s worth it now! Those are such great ideas, thank you for sharing! I love the way students support each other with a simple, yet meaningful cheer.